T P M S M T D J u n e 2 0 1 8 76 Your COMPLETE Tire Shop SOLUTION! 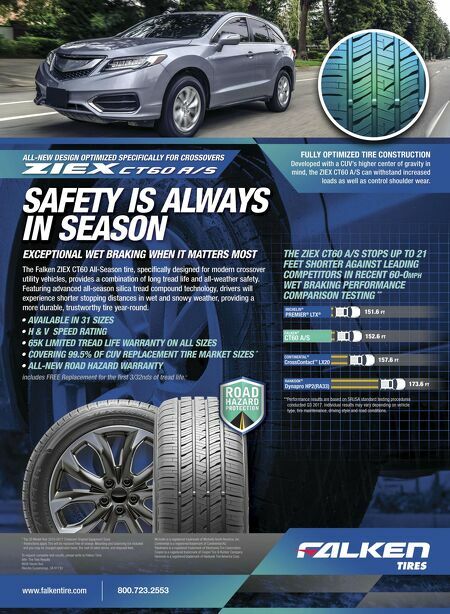 bartecusa.com [ 8 5 5 ] 8 7 7 - 9 7 3 2 TPMS Tread Pressure Bluetooth Point of Sale Contact your Bartec dealer about the hottest new trend in tire shop integration, and start selling more tires! CAUTION: Breaking the tire bead with the tire pressure sensor installed normally could damage the sensor. Be sure to always push the sensor so that it is completely inside the tire to prevent any damage. 3) Remove the nut. Push the tire valve completely into the tire. 4) Position the shoe (bead breaker) of the tire changer 0.40-0.78 inch (10-20 mm) from the outer edge of the wheel, and break both tire beads. 5) Remove the bead from one side of the wheel. 6) Remove the tire pressure sensor. 7) Remove seal washer and seal. Installation 1) Install seal washer and seal. NOTE: While maintaining contact between the sensor and the rim, manually start to screw valve nut for a few turns. 2) Insert the tire pressure sensor valve into the valve hole so that the polyurethane foam side faces the rim (see Figure 2). CAUTION: Do not retighten the valve nut aer the initial operation. 3) Install the nut from the outer side of the wheel. 4) Tighten the valve nut slowly (15 pm maximum) to 71 in.-lbs. (8 N.m) in one rotation. CAUTION: Do not position the tire changer near the tire valve, or tire pressure sensor may be damaged. 5) Set the tire changer so that it is 45 degrees away (point "A") from the valve hole (see Figure 3). CAUTION: Do not tilt or use excessive side force when checking air pressure or inflating the tire, or the tire pressure sensor may be damaged. 6) Fill the tire with air. Verify valve nut tightening torque. 7) Install the valve core and cap. 8) Install the tire and wheel assembly. 9) When a new sensor is installed, the ID code will need to be registered. See "Reset procedures." 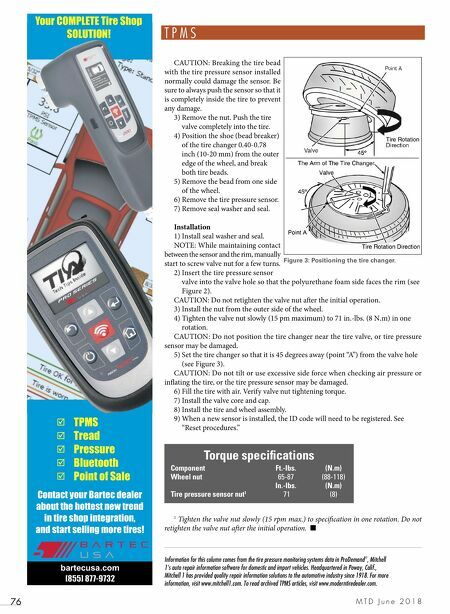 Torque specifications Component Ft.-lbs. (N.m) Wheel nut 65-87 (88-118) In.-lbs. (N.m) Tire pressure sensor nut 1 71 (8) 1 Tighten the valve nut slowly (15 rpm max.) to specification in one rotation. Do not retighten the valve nut aer the initial operation. ■ Information for this column comes from the tire pressure monitoring systems data in ProDemand ® , Mitchell 1's auto repair information software for domestic and import vehicles. Headquartered in Poway, Calif., Mitchell 1 has provided quality repair information solutions to the automotive industry since 1918. For more information, visit www.mitchell1.com. To read archived TPMS articles, visit www.moderntiredealer.com. Figure 3: Positioning the tire changer.